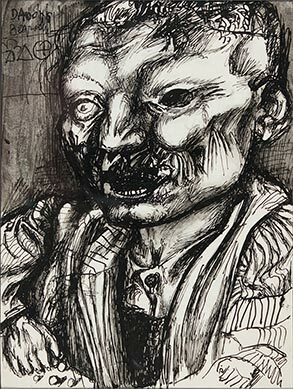 Left: Portrait of Danilo Kiš, 1955, ink and ink wash on paper, 41,5 × 30 cm. Formerly Jernej Vilfan collection. Photo: Domingo Djuric. 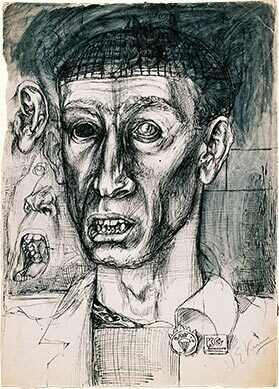 Right: Male Portrait, 1956, ink and ink wash on paper, 20 × 15 cm. 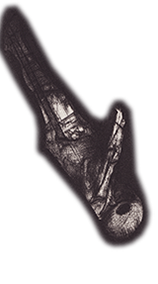 Man with umbrella, circa 1955, ink and ink wash on paper, 35 × 49,5 cm. 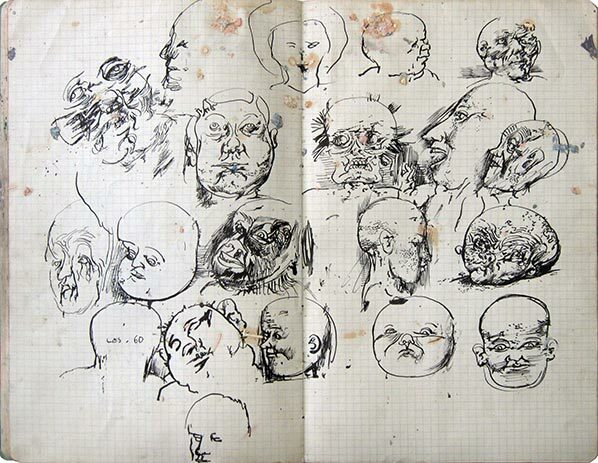 Left: Untitled, circa 1956, ink on paper, 49 × 35 cm. Formerly Jernej Vilfan collection. Photo: Domingo Djuric. 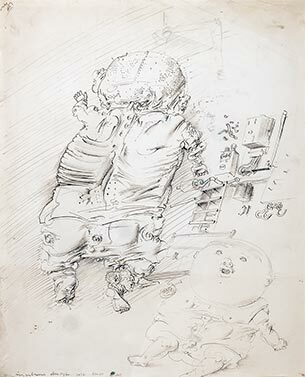 Right: Babies, 1956, ink on paper, 51,5 × 41,5 cm. Formerly Jernej Vilfan collection. 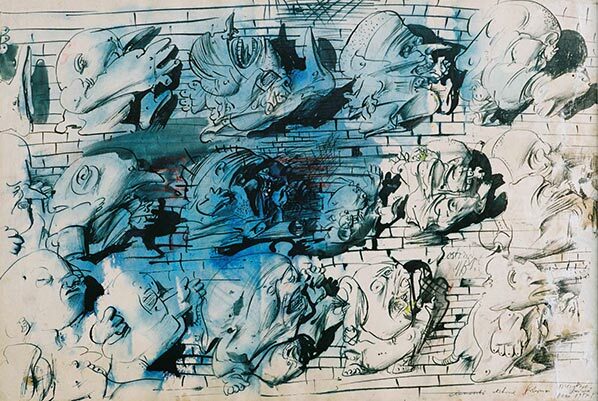 Battlefield, 1956, ink and ink wash on paper, 22,5 × 41 cm. Miloljub and Ivan Perić collection. 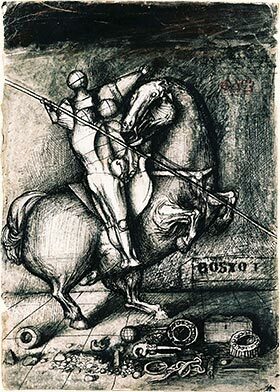 Left: Medieval Knight, 1955, ink and ink wash on paper, 42 × 29,5 cm. Formerly Jernej Vilfan collection. 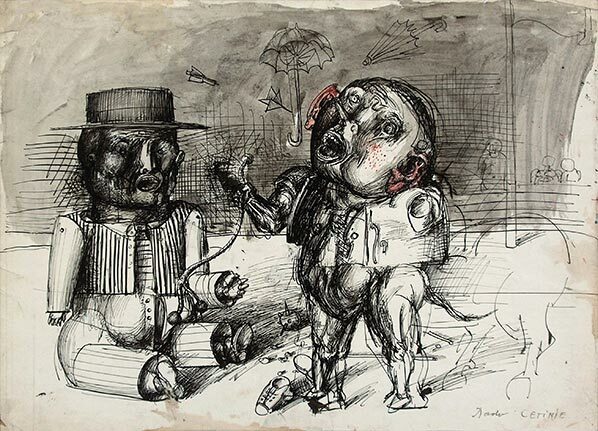 Right: Colloredo, 1955, ink and ink wash on paper, 47 × 35 cm. Formerly Jernej Vilfan collection. 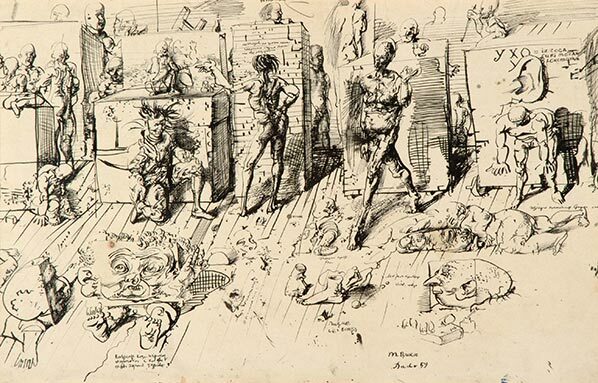 The Studio, 1959, ink on paper, 32 × 50 cm. Photo: Lazar Pejović. 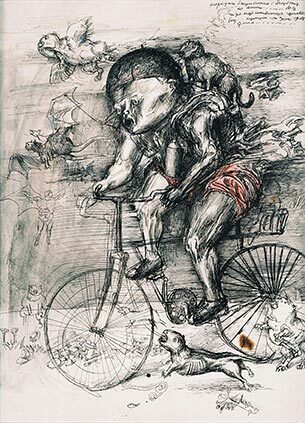 Left: Cyclist, 1956, ink and ink wash on paper, 39 × 28 cm. Formerly Jernej Vilfan collection. 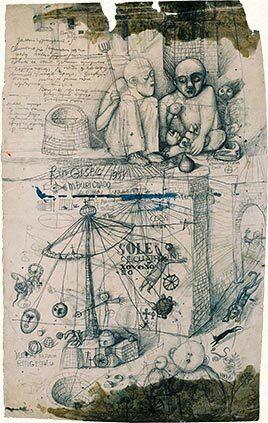 Right: Study for Carousel, 1954, ink on paper, 47,5 × 29,5 cm. Formerly Jernej Vilfan collection. 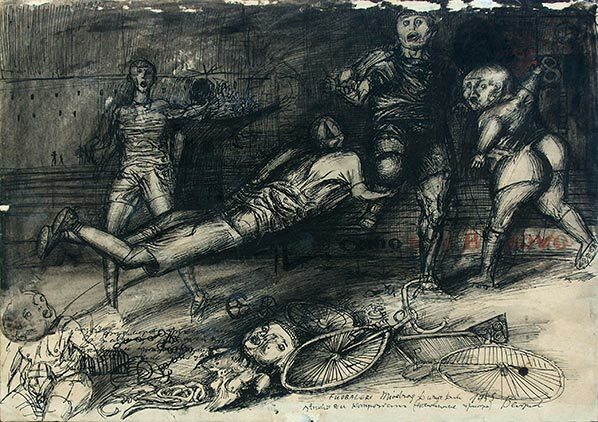 Soccer Players, 1955, ink and ink wash on paper. 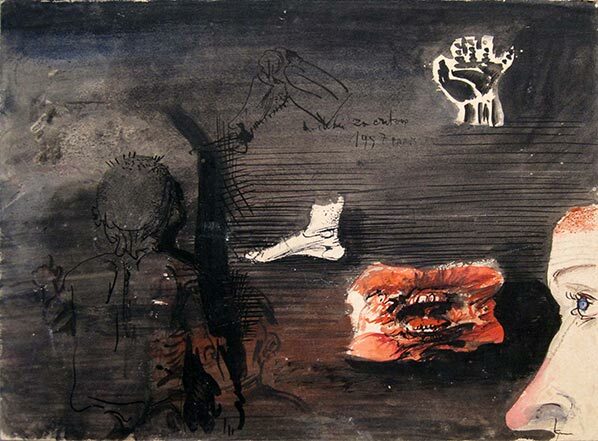 Untitled, 1955, ink and ink wash on paper, 29,5 × 42 cm. 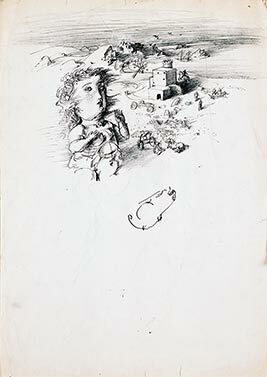 Untitled, 1957, ink and ink wash on paper, 28 × 38 cm. IMEC / Fonds Dado. 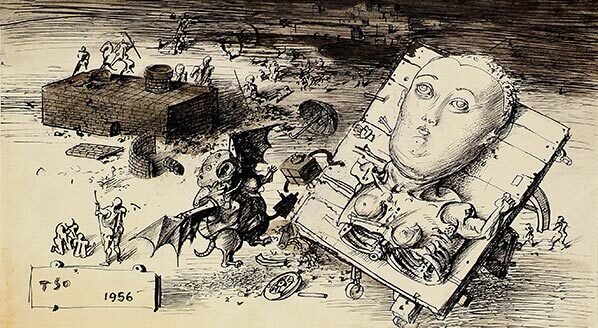 Ink on paper, 1959. Sketchbook. Each sheet: 31 × 20 cm. IMEC / Fonds Dado. 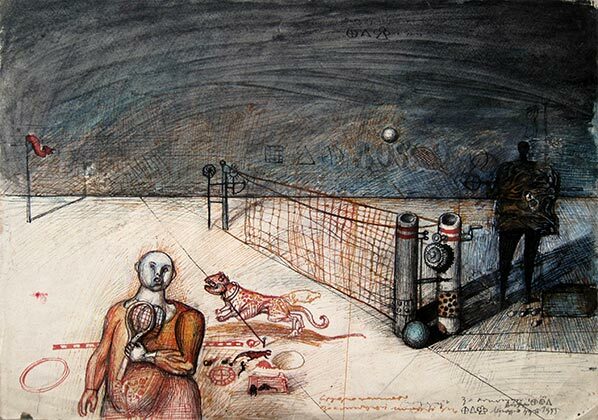 Untitled, 1959, ink and watercolor on paper, 37 × 56 cm. Photo: Domingo Djuric. 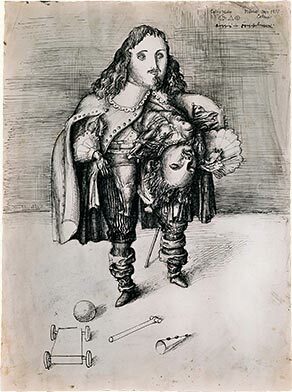 Giacomo De Nittis collection.